Two years ago, the farmers of Gondavle village in Satara district were unable to grow crops because their fields were submerged in water. Fate has been just as cruel to them this year. With no rainfall over the last two years, the villagers are now left with no water to farm. 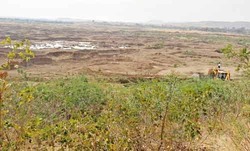 “The lake in the village has dried up,” says Sandeep Adhyapak, founder of water management firm Water Field Technologies, who visited the spot after he read about the water crisis in the region. The Mumbai-based civil engineer has been a keen proponent of rainwater harvesting for the past 12 years and takes every opportunity he gets to work in rural areas and advocate this method. Adhyapak was in the village for two days and helped the locals take the first step — a survey that led them to a spot where a well could be dug. “They have agreed to take up the project of rainwater harvesting, which will help keep the bore well replenished,” explains the engineer. “If the region doesn’t get rain this monsoon, it will be an extremely difficult year for them. But if it does rain, they will have a chance to conserve the water and fight to live another day,” he says. When Sandeep Adhyapak first took up rainwater harvesting projects in 50 villages in the Raigad district, he discovered that no doctor was willing to take up a job at the primary healthcare centres in the region. Bad water supply, he found was the problem. “Doctors were unwilling to live in areas with such poor water supply. It was near-impossible to run a healthcare centre without proper sanitation and running water,” says Adhyapak. After his team conducted geophysical surveys, they were able to identify fractures below the ground level. “The villagers were surprised to see that wells, which had been dug only to about 120 feet, were able to provide water,” says the civil engineer, who applied this model to villages in Alibag, Karjat, Panvel, Roha, and Murud in 2010. Today, there is a resident doctor at each of the primary centres at these villages. And running water is not a problem.